1095-C forms can be keyed in or imported from text files and spreadsheets. 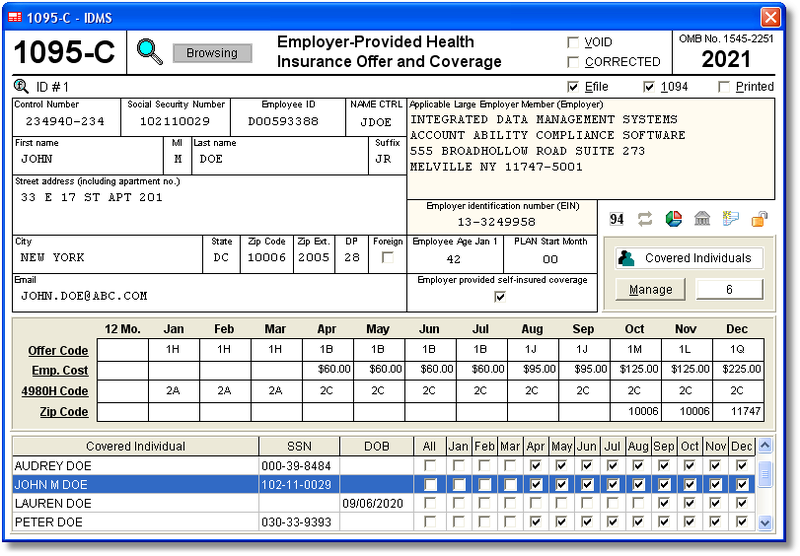 1095-C forms are easily maintained on user friendly windows resembling the actual IRS form (as shown above). Complies with Sections 6055 and 6056 of the Internal Revenue Code. Prints (ALE) Employer and Employee copies on blank paper (see SAMPLE OUTPUT below). Exports 1095-C forms to CSV text files compatible with Excel. 1095-C forms can be rolled foward from year-to-year at your option. Supports an unlimited number of Employers, Employees, and Covered Individuals. Imports transmittal 1094-C from spreadsheets and delimited text files. Prints and electronically files transmittal 1094-C. Displays IRS 1095-C reporting instructions and filing due dates. Employee comments, visible only to the filer, can be added to any 1095-C return. Employee copies can be delivered via Account Ability's optional Print and Mail Service. All of your 1095-C forms reside on your computer (or network), not ours. Shop for 1095-C forms and envelopes.